Kundalini Yoga Sadhana Guidelines, compiled by Gurucharan Singh, has been drawn from the wealth of teachings by the master, Yogi Bhajan. Focusing on the quintessential practice of Kundalini Yoga: Sadhana, it will fulfill the needs of both beginner and experienced students in their aim of achieving their human potential. 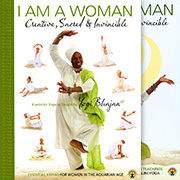 Originally published in 1974, it is right up there alongside Guru Rattana’s manuals as one of the best selling Kundalini Yoga books of all time. 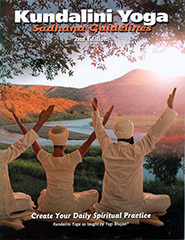 This new, second edition has been greatly augmented with additional material to help you get the most from your daily practice, featuring an updated essay on Morning Sadhana from Gurucharan Singh, outlining many of the essential points from the original edition, plus a review of various sadhanas given over the years. The original essays from Yogi Bhajan can still be found alongside the many kriyas and meditations that those of you in possession of the first edition have come to know and love. Over 30 exercise sets (kriyas) and 20 meditations will guide you into the experience of your vastness and beauty as a human being. Each touches and activates different potentials of the self, and strengthens and balances the body’s physical and subtle systems, describing how they are being affected by the practice. The sadhana practices included are great spiritual meditations to raise your awareness and connect with your higher self. Also included are some new kriyas, such as Kriya for the Morning Sadhana and Tershula Kriya. A highly readable text with clear instructions, simple explanations and copious illustrations, this book is an excellent investment for anyone wanting to start their own practice at home, or for those more advanced students wishing to refine their techniques. Far more than just a Kundalini Yoga text book, the letters and discussions from Yogi Bhajan provide real depth and understanding, and can be referred to again and again, each time providing the reader with further insights. Practicing the kriyas and meditations found in Sadhana Guidelines will provide a level of knowledge unparalleled in the realms of human experience. Each technique should be cherished as a precious jewel, to be practiced and experienced on your way to physical health, mental and emotional balance, and a new plateau of expanded awareness. Gurucharan Singh Khalsa is a psychotherapist, teacher and writer, and is a world recognized expert in the science and technology of Kundalini Yoga. He is a business consultant, therapist, MIT instructor and director of a large community of yoga practitioners. Today, he is a leading expert in Kundalini Yoga and meditation and his passion for teaching this ancient form of yoga insures that, through his work, he is able to continue assisting people in great numbers.